Let me go on the record and say that the canine teeth are evil little boogers when they decide to come in. I vaguely recall these teeth being the worst when NHL was little, but my memory was quickly restored thanks to JSL. The little guy has been an absolute mess the last week or so. He does not want to eat, prefers nursing (YES he is still nursing) more often, will not settle at night to sleep, and is up many times during the night. Last night was particularly bad. He did not settle until we pulled out the Motrin and gave it to him. Of course it helped him to get to sleep initially, but did not last. JSL was up at least 3-4 times during the night. After the second time he was up howling, he ended up in our bed where we all seem to be able to sleep some. Prior to these evil little teeth pushing their way into JSL’s mouth, getting him to sleep at night was fairly easy. He loved to snuggle up with his new silky blanket and a pillow. Thanks to a great giveaway on An Island Life we were introduced to Kennedy Grace Boutique on Etsy. Cathi’s baby blankets are absolutely amazing. 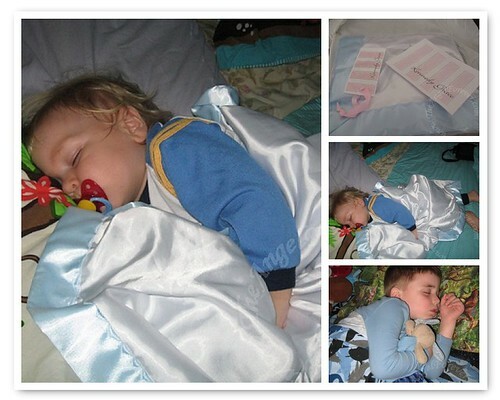 JSL quickly declared the beautiful silky soft new blanket his. We had Cathi make it with our last name so either of the boys could use it. NHL gladly allowed JSL to have it since he is quite attached to his "squeaky" blanket buddies. Thanks again to Kailani and Cathi for helping to make our non-teething night time routines so wonderful. I can not wait until these pesky teeth are in and JSL can go back to simply curling up with his silky blanket to have sweet dreams. We’ve had a much harder time with the molars than we would like. Once the top two came in, we got two nights of sleep before the bottoms began their journey. Argh!